First anniversary wishes for couples: 1st wedding anniversaries are all about celebrating the end of one of life’s most romantic years. The first twelve months in a married couple’s lives are exciting, sizzling and simply heavenly. Write a cute quote on a card, scribble a handwritten note, tag the couple in a funny tweet or post funny husband-wife jokes on their Facebook – help the couple cherish their wedding’s first milestone by sending sweet messages that heighten the sublime aura of love and romance. Take ideas from this post to create your own greeting to congratulate the happy couple for taking the first steps towards a lifelong union. 1) Like the clear blue skies, your love is fresh and bright. Like the sea, your love is vast and enchanting. Like a rainbow, your love has many vibrant hues. Like a blooming flower, your love’s fragrance is mesmerizing. Happy first anniversary. 2) Seeing you together for one year was enough to make me realize that marriage is indeed the beautiful union of two hearts, minds and souls. Happy first wedding anniversary. 3) I am afraid that being around a couple as sweet as you will make me diabetic. Happy first anniversary. 4) You may be two individuals but your souls have become ONE. Happy 1st anniversary. 5) Your married life is like a young rose bud waiting to burst open. When it blossoms into a beautiful flower it will fill your life with the everlasting fragrance of love and the beauty of companionship. Happy 1st anniversary. 6) The sweet innocence of your love is profound. In this regard, may maturity be never found. Happy 1st anniversary. 7) You both are not just any other beautiful couple. In your chemistry, there is something special. Just looking at you both talk like two teenagers in love, makes it seem that your pair was matched by the heavens above. Happy 1st anniversary. 8) Today I am going to send a congratulatory greeting card to Cupid for doing such a good job with you both. Happy 1st anniversary. 9) The beauty of celebrating your first anniversary is the ignorance that the rest of them will be nowhere near so wildly romantic. Happy first anniversary. 10) I always thought that money is everything in life, until I saw the tender love between you and your wife. Happy first anniversary. 11) Twelve months of peaking romance, never-ending hugs and sizzling kisses calls for a celebration. Happy 1st anniversary. 12) The sun seems to be shining brighter, the skies seem a bit bluer and the birds seem a bit chirpier – all because today is the anniversary of a sweet couple unlike any other. Happy 1st anniversary. 13) A year ago on the same day you were gazing into each other’s eyes and saying I do. One whole year has passed and you still haven’t stop gazing. Happy first anniversary. 14) Since first impressions are the last impressions, be sure to celebrate your first anniversary as if it is the most important anniversary of your life. Happy first anniversary. 15) You may be a young couple but the maturity of your relationship is that of someone celebrating their 50th anniversary. Cheers to you both. 16) I hope that you never have a dull moment in your life, I hope that your marriage is free of strife, I hope you always remain the epitome of the perfect husband and wife. Happy 1st anniversary. 17) In the first year of your marriage, you both have walked with each other in perfect sync. If you ever happen to stumble, think about all the promises you made when you exchanged your wedding ring. Happy first anniversary. 18) Whether it is the first or the fiftieth, every anniversary is a testament of your patience and perseverance in tackling life together as a couple. Happy 1st anniversary. 19) Your first anniversary is a turning point in your married life after which the cute bad habits of your partner won’t seem cute any longer. Happy first anniversary. 20) As a couple you are cuter than Mike and Molly, cooler than Leonard and Penny, more romantic than Ross and Rachel and way more made for each other than Homer and Marge. Happy 1st anniversary. 21) Your first anniversary should be a warning to you. The first twelve months of your life as a couple are now over and the gloves are expected to come off any time soon. All the best. 22) When you both had a crush on each other I thought you both were being silly. When you started dating, I thought you made a quite a pair. When you got married, I thought you made a lovely couple. And as you celebrate your first anniversary, I can finally see that you are made for each other. Happy first anniversary. 23) Look at your first anniversary as life’s way of reminding you how madly you are in love with each other since the day you met. Happy 1st anniversary. 24) Since the first time you met to the first time you went on a date to the first time you confessed your love for each other – both of you have come a long way and bloomed into a beautiful couple. Happy first anniversary. 25) As you read this message, look for wood around you because you both make the most beautiful couple ever – touch wood. Happy 1st anniversary. 26) May the warmth of your partner’s hug be warmer than the feeling of sitting in front of a crackling fireplace on a cold night. Happy first anniversary. 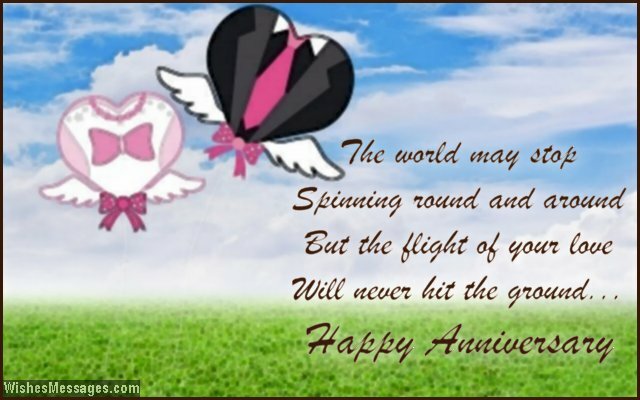 27) A first anniversary is like a trailer of the movie of your married life. It gives you a glimpse of all the twists and turns, suspense and climax that you will experience in the future. Happy anniversary. 28) In the circle of your married life – bank balances will rise and fall, troubles will come and go, jobs will be new and old, debts will appear and disappear, children will be younger and older. But I hope that happiness and love forever remain. Happy 1st anniversary. 29) I take pride in wishing you both on your first anniversary because you are a perfect example of a happy and loving couple. Have a good one. 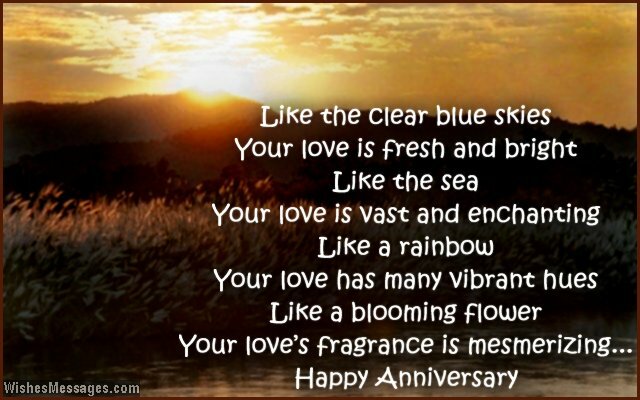 30) I thought of writing a few rhymes for your first anniversary card. But who am I to write a rhyme for a couple whose love life is as beautiful as a romantic poem by Shakespeare. Happy 1st anniversary. 31) The world may stop spinning round and round, but the flight of your love will never hit the ground. Happy first anniversary. 32) I thought that your wedding was the most beautiful thing I had ever seen but I was wrong. Your married lives are way more beautiful and enchanting. Happy 1st anniversary. 33) A first wedding anniversary doesn’t mean that your marriage is one year old. It means that your marriage is one year strong. Happy first wedding anniversary. 34) A year back, your friends were busy making a sign for your car which said Just Married. A year later they are all busy making a card for you which says Best Couple Ever. Happy first anniversary. 35) Congratulations, you both have successfully managed to tolerate each other for one whole year. Wish you both a happy first anniversary. 36) When anyone asks me if true love exists, I just ask them to take a look at you both. Happy first anniversary to the cutest couple ever. 37) I hate to be the bearer of bad news, but the end of the first year of your marriage signifies the turn after which the quirky sides of each others’ personalities will actually begin to look like flaws. Happy 1st anniversary. 38) For you both, your first anniversary is yet another reason to celebrate the beautiful love in your life. For me, it is another reason to burn with jealousy. Happy anniversary. 39) I am not saying that your lives are perfect. Everyone has flaws but very few couples like you learn how to cherish each other’s strengths and weaknesses as well. Happy first anniversary. 40) The problem with couples like you is that they make everyone else jealous. I envy you, but I am happy for you too. Happy anniversary.